It was an early morning this past Sunday as my alarm chimed at 4:20AM. I woke up feeling hazy and slightly groggy after a sun soaked day of race organizing and grilling/drinking all afternoon with my team. I walked across my room and pulled the curtain back to reveal the cool blue sky of a perfect day. I had a guest and fellow runner visiting from Seattle who stayed the night after running our Summerfast 10k so that he could check out the Race I was doing. I prepared a basic smoothie comprised of greens, frozen fruit and a banana and threw on a pot of coffee. I knew there would be no Starbucks open at this early hour and we were set to be on site for the race at 6am. So I pulled out my home brew Pike Place instead. It worked like a charm but I didn't have any honey and was forced to consume white sugar. So with my smoothie down the hatch and my coffee to go, we were on the road in Kevin's old VW wagon that runs on Vegetable oil! The thing hauls for an old beater and he drives for free. He actually makes money with that thing, sweet! I always enjoy driving at this hour because there is no one on the road. Even better on race morning is not driving. I had approached this race with only one goal in mind, try to beat K.O's course record of 1:15:47. I knew that Drew would be there and I was sure that if he was in good shape that he could certainly give me a good run after my time off and his recent hard work and comeback. I did not put any emphasis on my diet or taking it easy on the beers at the barbecue, beca use I knew this race wouldn't be too serious. On our way there, we saw the sun pushing itself up from behind the mountains. The sun's rays shot out from behind the range sending streaks of light up into the sky. What an inviting morning. Before seeing this I actually had a brief anxious moment about this race. Glad it was brief and quickly passed. We arrived almost first on the scene. Great parking. There wasn't much going on until right before the start. It was great to see Paul, Phil, Ryan, Lorne and Lisa from The White Rock Peninsula Runners store. They used to be my team when I was living in White Rock. Peninsula Runners has fantastic staff with amazing product knowledge and a superior product selection. I recommend this store for anyone who is into running and serious about getting great running gear and expert advice. except1/2 a percent. I knew my legs could comfortably move a little bit quicker. Drew pushed ahead once again only to slow me down once more. I passed him again and wondered what this battle was about so early in the race. I knew my cadence allowed me to be slightly faster than Drew today and I felt light and comfortable as I added 1 more percent of effort. We cruised through 6 k and a water station and the the string began to grow very taunt. It was a very short time later on this long flat straight away where I could feel the string break. So long as I can keep this effort up, I know I can prevent that string from connecting again. son of a mountain that hill was!! I felt strong and was very happy with myself at this point, but my breathing was heavily labored and I was having a long hard time returning it back to normal. We twisted and winded until a very short and extremely steep downhill shook the wits out of me. One right turn and we were on a very straight shaded and slightly downhill section of road. The pavement was nice and flat and smooth and I knew this was the break I needed to recover for the final sections of this race. award ceremony was great and I made it out of there with $150.00 to spend at Peninsula Runners. The Peninsula Runners crew put on a very well organized and clearly marked event. Their timing for the event was efficient and things (awards, race start) began when they were scheduled to. I enjoyed the challenging course and the country roads reminded me of home in rural Ontario. Drew won this race last year, and for that he was awarded the privilege of wearing the bib #1. At the awards Paul Williams (store owner and former 3X Canadian Olympic runner) Said that if I come back next year I can wear the #1 bib. Not only will I be back to wear it, but I will be back to break my record and I will frame that bib! Unless I receive a #1 bib before then. We'll see. 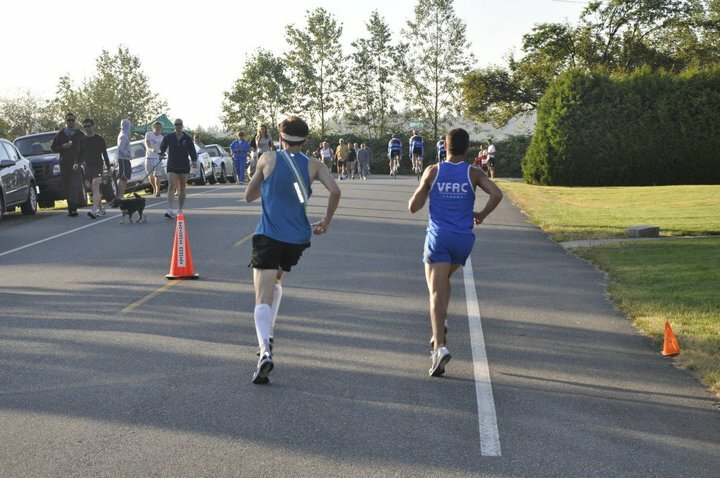 Maybe Richmond Oval 10k?? It was a great morning and we were back in Vancouver for 11AM. Sometime early starts can be hard but it's nice to have everything wrapped up early so you still have time for a nap and the rest of the day. I had a hard time napping as I knew I had to wake up shortly and go give two 90 min massages back to back. I awoke from my nap groggy sore and tired as can be. I slept horribly the night before the run so this restless nap only seemed to compound my fatigue. I didn't have it in me to do these massages with my regular great energy so I thought it was a better idea to reschedule my clients. Thankfully they were pleased to give me the night off and said I had earned it. I know this seems weird, but as soon as I got off the phone with them I had started to get my second wind. I had two invites this afternoon and could now fully enjoy them. First, down to Kits beach with some girlfriends for a lounge and then out to play a pickup soccer game with some more friends. The beach was just the relaxation I needed, and the soccer game was a blast! I must have run another 10km in the game. I wish I had my Garmin on for the race and the game. I didn't plan on playing so hard, but there were so many good players, I couldn't resist showing off my athletic ability. It was so amazing sharing the field with so many great athletic guys and girls. And we won by 5 points. To cap off such a great day/weekend, we went over to my buddy Simon's for some burgers and beer. Things I love: When Business is great!